The undead are so hip now that movies centered on brain-eating can hardly be considered niche anymore. Zombie films still perform well enough at the box office (I AM LEGEND, 28 DAYS LATER, RESIDENT EVIL) to ensure someone somewhere keeps churning them out. Remakes of titles by zombie movie godfather George Romero arrived in 2004 and 2008, and flicks like SHAUN OF THE DEAD and ZOMBIELAND tweaked formula using the “buddy” template. 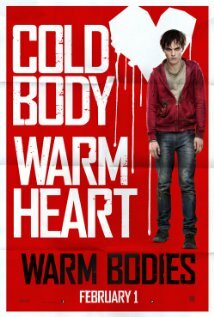 With WARM BODIES, director Jonathan Levine (50/50) attempts to subvert the popular zombie genre by casting corpses as the unfortunate, morally ambiguous victims of an eight-year plague rather than the indisputably evil, flesh-craved villains of yore. Based on Isaac Marion’s popular 2010 novel of the same name, it’s essentially an apocalyptic love story for the TWILIGHT set that fuses (mild) zombie violence with tropes from teenage romantic comedies. In short, it’s a zom-rom-com. Think ROMEO AND JULIET go to the morgue. Heck, there’s even a balcony scene. Twenty-something R (Nicholas Hoult) is one of hundreds of corpses wandering the outskirts of an unnamed metropolis in search of living humans to feed upon. He can’t speak—not well, anyway—but through his voiceover we learn he’s self-conscious about his bad posture, lumbering gait, and gruesome eating habits. R can’t recall his full name or how he became one of the undead. He “lives” in a 747 on an abandoned airport tarmac, has the occasional grunt-chat with friend M (Rob Corddry), and wishes he could feel something—pleasure or pain—that might re-humanize him. If he loses all hope, he’ll eventually devolve into a “Bonie,” a beyond-death entity consisting of little more than a skeleton wrapped in rotted skin. R looks awfully GAP for a stiff and has fine motor skills for someone whose muscles should have atrophied. His red sweatshirt and jeans appear dirty but aren’t torn or mottled with blood. People become zombies after being bitten by one, or so goes the rule, yet R and his pasty friends evince neither outward signs of mandibular molestation nor traces of their bloody feasts. R can open car doors and overhead compartments on his plane, and accurately drops the needle on a vinyl LP. Later, he’ll re-learn to drive. Human survivors hunker in the city center, their last refuge surrounded by a thirty-foot wall and protected by armed guards. General Grigio (John Malkovich) dispatches foot patrols outside to search for other survivors and “kill” zombies with a gunshot to the head (another movie convention). The team sent out here consists entirely of teens and twenty-something civilians—including Grigio's pretty daughter, Julie (Teresa Palmer). The story (and target demographic) calls for it. Julie’s team is ravaged by a zombie attack orchestrated by R and M. Her boyfriend, Perry (Dave Franco), succumbs to R—who immediately (and preposterously) inherits Perry’s memories after eating his brains. Taken by Julie’s beauty, R helps her escape the horde and offers sanctuary in his 747. She’s reluctant, of course, but senses there’s something different about her rescuer. He’s not like the other undead boys. Apparently R and his airplane bachelor pad don’t reek of death; Julie doesn’t gag or mention any putrid stench. She questions R about his past and gets noncommittal shrugs and grunts in return. But her host is gracious, offering normal food and playing passenger for Julie’s joyrides in the Jags and Beemers left in the airport parking garage. She doesn’t know R’s been snacking on Perry’s frontal lobe leftovers, which nourishes his attachment to her. So they're going to have relationship issues. M envies R’s transformation and wonders if he and the other corpses might somehow become more un-undead, too. They band together for a fight against the growing legion of Bonies, who become just as attracted to them as to fully-living humans. Julie, R and M must convince Grigio that perhaps the corpses can be “cured,” and that the Bonies are the real enemy. A common enemy. To say Levine deviates from zombie cinema’s most steadfast rules is putting it mildly. His corpses develop conversation skills, learn to repress their bloodlust, and work toward common goals. Phrases like “You can’t go there—they’ll kill you” occur more than once, and in reference to the corpses—who by definition are already dead. Later, "injured" corpses bleed from hearts that ought to resemble lumps of coal. The liberties taken with zombie lore are beyond illogical (even for a zombie picture), and there's little internal consistency. So don’t walk in expecting anything about the corpses and Bonies to make sense. As with Romero’s movies—all of which contain bits of satire and social commentary—Levine threads his narrative with cultural observation. The airport’s escalators, conveyors, metal detectors, and “white zone for loading” P.A. system bespeak how much like automatons we’ve already become. The few memories R has are populated by people more concerned with their iPods and cell phones than genuine interaction. An early gag involving Prozac (actually, it’s Fluoxetine) suggests it’s somehow wrong to feel sad, and that we inadvertently spawn “zombies” everyday in our eagerness to artificially compensate for any perceived unhappiness. This one is safe for teens, parents, but it warrants the MPAA’s PG-13 rating. It’s not too gruesome, but there are a couple “scares” and the requisite gunplay. The lone F-bomb is used for laughs but could have been omitted. The soundtrack boasts familiar fare (by Guns ‘n’ Roses, Bruce Springsteen, John Waite, and Scorpions) that elicits giggles and sighs in just the right spots, but the movie itself is neither funny nor thrilling enough to sate the SHAUN and LEGEND crowds. WARM BODIES is cute enough for teen dates and brisk (and brief) enough for a Friday night rental. Hoult and Palmer make it…digestible. 2 out of 4 stars.